Kennedy, Dorothy and Randy Bouchard. "Coast Salish". The Canadian Encyclopedia, 16 October 2018, Historica Canada. https://www.thecanadianencyclopedia.ca/en/article/coastal-salish. Accessed 18 April 2019. Transformation mask by Ken Mowat shown closed. A transformation mask expresses the theme of metamorphosis between beings of the land, sea and sky. 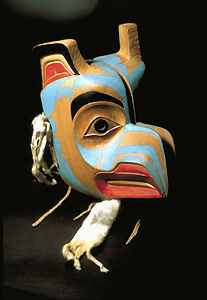 Mask of cedar and ermine tails by Ken Mowat. A Coast Salish canoe awaiting traditional invitation by the S'Klallam people to make landfall at a beach in Port Angeles, Washington, USA. Historically, Coast Salish peoples lived in permanent villages during the winter. When they gathered food in the summer, they lived in temporary camps. Fishing was, and remains, an important part of Coast Salish culture and economy; the harvesting of fruits, vegetables and nuts supplemented their diet. Potlatches were (and still are) important to Coast Salish society and culture. They functioned to distribute wealth; confer status and rank upon individuals, kin groups and clans; and to establish claims to names, powers and rights to hunting and fishing territories. 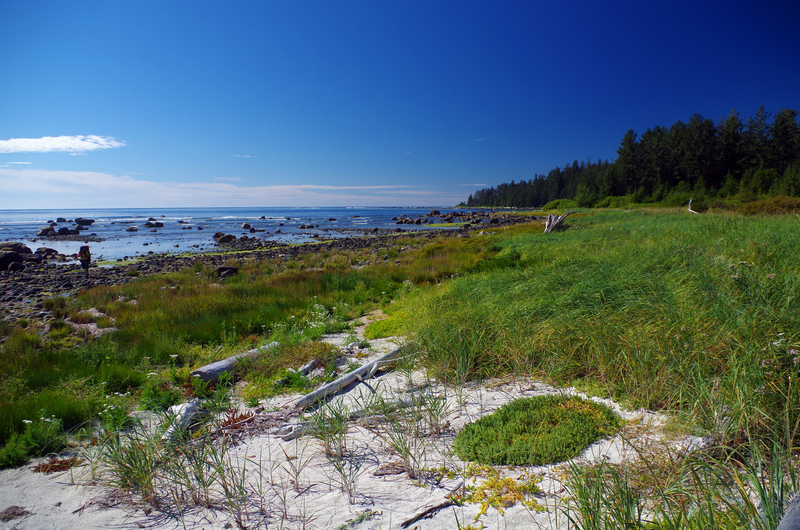 Coast Salish culture and traditional knowledge survive through oral histories. 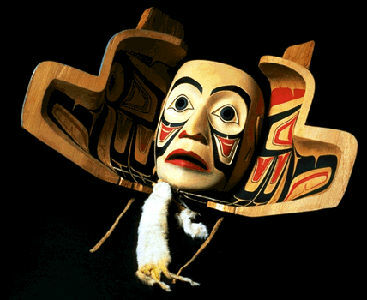 Although Coast Salish legends vary from nation to nation, they often feature many of the same spiritual figures and tell similar creation stories. One example of such a tale is the story of how Old-Man-In-The-Sky created the world, animals and humans. These stories also highlight the importance of certain creatures and elements of nature, such as the salmon and red cedar, which are considered sacred for spiritual reasons and because of the valuable resources they provide for the people. Coast Salish languages are part of the Salishan linguistic family. Many Salishan languages are endangered because of federal policies and programs aimed at assimilation, such as residential schools, which significantly decreased the number of fluent speakers. Language revitalization programs, such as those at local universities, colleges and high schools, record and promote these Indigenous languages as much as possible. Coast Salish peoples encountered European explorers and traders in the 18th century. In the 19th century, the Hudson’s Bay Company established trading posts in Coast Salish territories, such as Fort Langley in Halkomelem territory (1827) and Fort Victoria in Lekwungan territory (1843). With the arrival of settlers throughout the 19th century, Coast Salish peoples were increasingly displaced. Moreover, the Coast Salish population was significantly reduced by smallpox epidemics in the 18th and 19th centuries. Between 1850 and 1854, the Governor of Vancouver Island, James Douglas, made treaties with Coast Salish peoples as a means of freeing up their traditional territories for white settlement. In these treaties, commonly known as the Douglas treaties, Indigenous signatories forfeited their title to the land in exchange for clothing, cash and other goods. Descendants of these signatories have argued that their ancestors were unaware of the true meaning and intent of the treaties — the surrender of their rights to the territory. Rather, they believed they were signing a treaty to share the land. Many contemporary Coast Salish peoples also contend that some of their ancestors signed blank sheets which were later filled by the colonial government with conditions that the Indigenous signatories had not seen. Today, many Coast Salish nations are actively pursuing treaties and land claims with federal and provincial governments, and are working towards self-government. 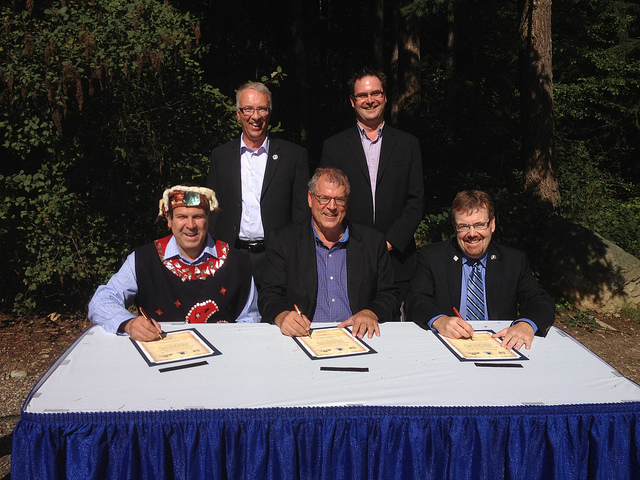 Some Coast Salish nations have banded together to achieve their shared goals, such as the Hul’qumi’num Treaty Group, (founded in 1993), which includes six First Nations: Cowichan, Chemainus, Penelakut, Lyackson, Halalt and Lake Cowichan. 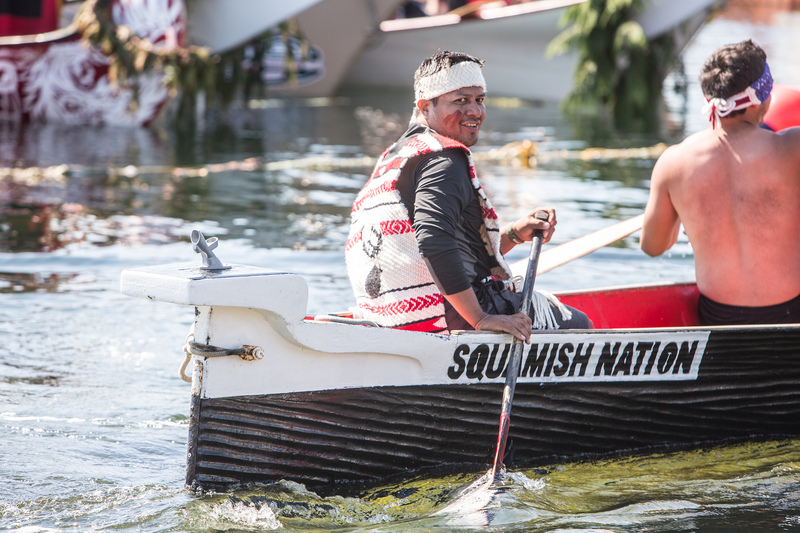 Coast Salish peoples strive to protect and promote their history, heritage and way of life through various cultural and educational initiatives. Community leaders work together to defend the environment and their rights to harvest natural resources. Since 2005, the Coast Salish Gathering — a cross-border organization representing Coast Salish environmental interests — has met annually to discuss and develop the health of the Salish Sea ecosystem. Julie K. Stein, Exploring Coast Salish Prehistory (2000). Bruce Granville Miller ed., Be of Good Mind: Essays on the Coast Salish (2011).